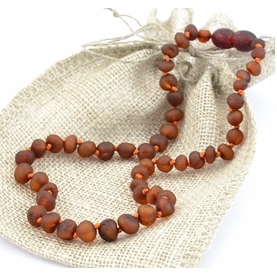 Cherry Teething Amber Necklace: Reduce pain naturally for your baby. Beautiful Cherry Teething Amber Necklace handmade from the finest quality polished and raw olive shape Baltic Amber beads. Amber Teething Necklace are made to wear but not to chew! Teething jewelry should be removed when child is sleeping or unattended! 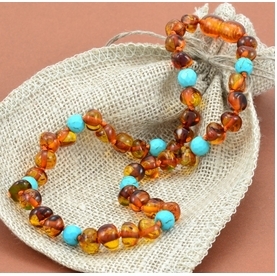 Learn more about Teething Amber Necklace . 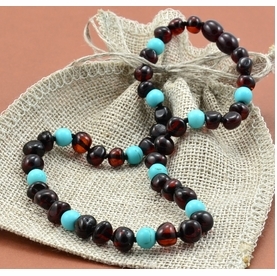 Made by high skilled amber artisans, it is all handmade. Amber Teething Necklaces has unique properties to reduce inflammation, accelerate healing process as well as boosting the immune system. Check out our matching beautiful Adult Amber Healing Necklaces. 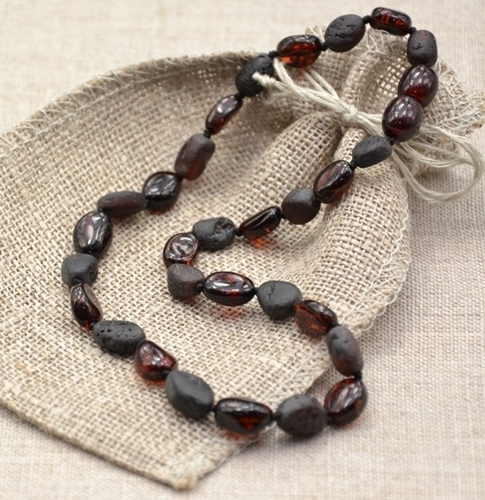 Baltic Amber has many therapeutic qualities and provides natural pain relief. Amber works by the skin warming the Amber which releases healing oils and the oils are then absorbed into the blood stream. Amber reduces red inflamed cheeks and stimulates the thyroid glands to reduce drooling. The active ingredient is succinic-acid which was analysed by the pioneer of modern bacteriology, the Nobel-prize winner winner Robert Koch (1886), who confirmed its positive influence and recent scientific research has also proved that succinic acid has a very positive influence on the human organism. Succinic acid is a powerful antioxidant that helps fight toxic free radicals and disruptions of the cardiac rhythm, succinic acid has been shown to stimulate neural system recovery and bolster the immune system, and helps compensate for energy drain in the body and brain, boosting awareness, concentration and reflexes, and reducing stress. Safety is a priority for us when manufacturing our necklaces, to enable us to offer you the highest safety for your child we only use Screw Clasp that opens and closes easily and naturally. The string in each of our Amber Teething Necklace is knotted by hand in between each and every bead, so should the necklace break (which it should if necessary), the rest of the beads will not scatter. Teething necklace are made to wear but not to chew! Teething jewelry should be removed when child is sleeping or unattended! 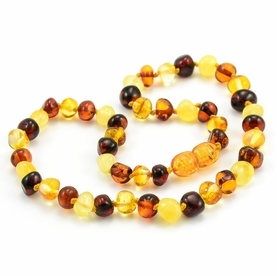 The Amber Teething Necklace is extremely light, and warm to the touch. Your child will probably not realize that they are wearing a necklace at all. There are a lot of options available when it comes to Amber Healing Necklaces. The quality of our designs is second to none because every is hand-crafted by Baltic amber specialists who have generations of experience in polishing and softly rounding every Baltic amber bead until it reaches ultimate perfection. Learn more Why Buy From Us.